Our Lady of Perpetual Help, Perpetual Help, Virgin Mary. Our Mother of Perpetual Help is the title given to the Blessed Virgin Mary after a 15th century Byzantine icon painted in gold. The earliest written account about the image is from a Latin and Italian plaque that was placed in the church of Saint Matthew where it was first venerated by the public in 1499. The painter of the icon is unknown, but according to legend, the icon was stolen by a merchant from Crete who was sailing to Rome. The merchant supposedly sailed and hid the icon and while traveling on sea, and a storm hit hard and the sailors prayed to the icon for help. When the merchant arrived in Rome, he fell ill and asked for another merchant friend to find a church where the icon would be venerated as his dying wish. The merchant then confided to his wife about the icon. Upon seeing the beautiful icon, the merchant's wife refused to give it to the church but instead hung it in her home. Later on, the Virgin Mary appeared to the merchant's daughter who asked that the icon be turned into a parish for veneration. The Virgin Mary indicated to the little girl that she be placed between the basilicas of St. Mary Major and St. John Lateran. The wife then went to the Augustinian Friars to whom she gave up the icon. On March 27, 1499, the icon was transferred to the church and the icon was venerated there for 300 years. In 1798, the governor of Rome, General Massena ordered several churches in Rome closed and destroyed. St. Matthew was one of these churches. The perpetual help icon was taken by the Augustinian fathers, who moved to a nearby church, St. Eusebius. Later on they moved to Santa Maria Posterula where the icon was moved to a side altar. Pope Pius IX had invited a group of priests called the Redemptorists to set up a Marian house of veneration in Rome. They stationed in Via Merulana, not knowing that it was once the church of San Mateo and shrine of the once-famous icon. One day, a Redemptorist father heard stories of the icon and the church that it was once enshrined in. The Redemptorist built a small church next to the building called St. Alphonse of Ligouri. The Father General of the Redemptorists, Most Rev. Nicholas Mauron, decided to bring the whole matter to the attention of Pope Pius IX. The Pope decided that the icon be exposed to public veneration and the logical site was their church of St. Alphonse of Ligouri, standing as it did between the Basilicas of St. Mary Major and St. John Lateran. Pope Pius IX wrote a short memorandum ordering the Augustinian Fathers of St. Mary in Posterula to surrender the picture to the Redemptorists, on condition that the Redemptorist supply the Augustinians with another picture of Our Lady of Perpetual Help or a good copy of the icon of Perpetual Help in exchange. Upon the return of the icon, Pope Pius IX gave the icon the title Our Mother of Perpetual Help. Today, the icon is under the care of the Redemptorist fathers of St. Alphonse of Ligouri church where the icon is now enshrined. The icon depicts the Blessed Virgin Mary wearing a dress of dark red with blue mantle and veil. On the left is the archangel Michael, carrying the lance and sponge as instruments of Jesus Christ's crucifixion. On the right is the archangel Gabriel carrying the a 3-bar cross and nails. This type of icon is classified as hodegetria, where Mary is pointing to her son. The facial expression of the Virgin Mary is solemn and is looking directly at the person instead of her son. The Greek initials on top read Mother of God, Michael Archangel, Gabriel Archangel, and the Jesus Christ, respectively. Jesus is portrayed as if clinging to his mother with a falling sandal, indicating for help through the grace of his mother. 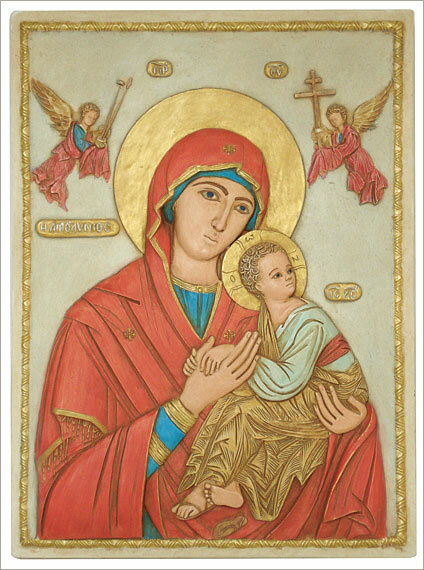 The icon is painted with a golden background. Since then, the icon has been venerated all around the world. The icon has been popularized among many cultures and has had several titles in different languages such as Nuestra Se�ora del Perpetuo Soccoro, Perpetuo Succursu, Beata Virgo de Perpetuo Succursu and Mother of Perpetual Soccour.